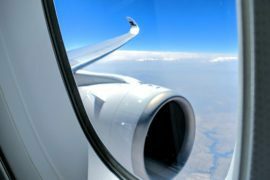 UPDATE: Finnair is launching a direct route to Los Angeles in spring 2019 and will be using A350 on that route. 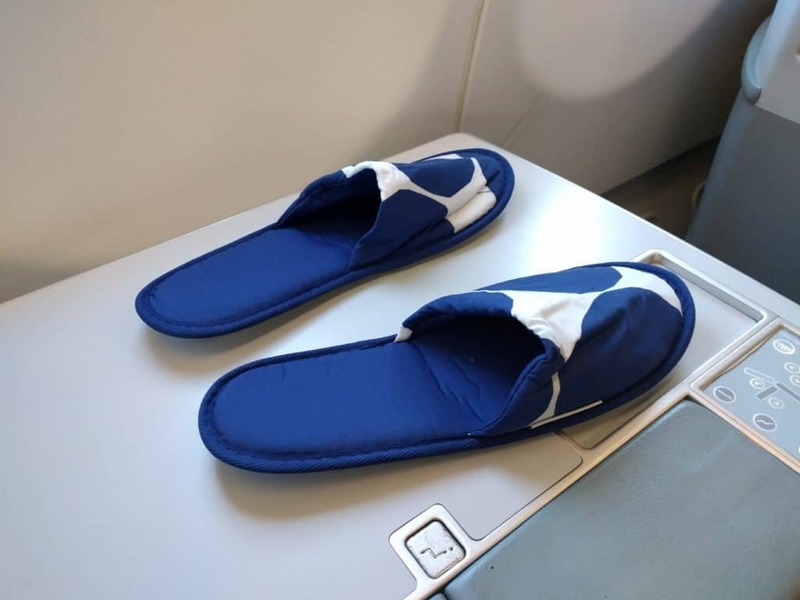 I had a chance to fly from Helsinki (HEL) to New York (JFK) on Finnair A330-300 during my December 2017 trip to the US. 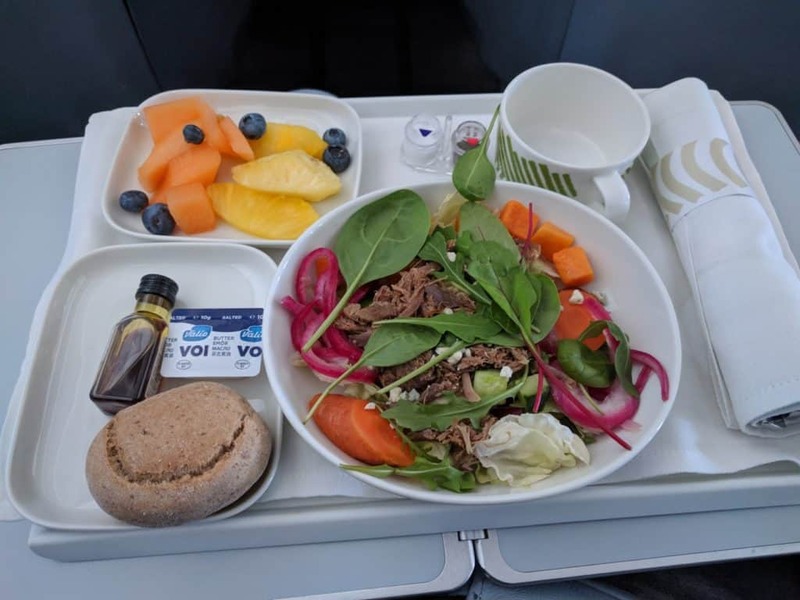 Finnair A330 business class is definitely not the most comfortable option out there, it’s much much worse than Airbus A350-900 which is used for example on route from Helsinki to Hong Kong. I booked the tickets through American Airlines website due to the lower price. Also, the majority of the flights during my trip were on AA. 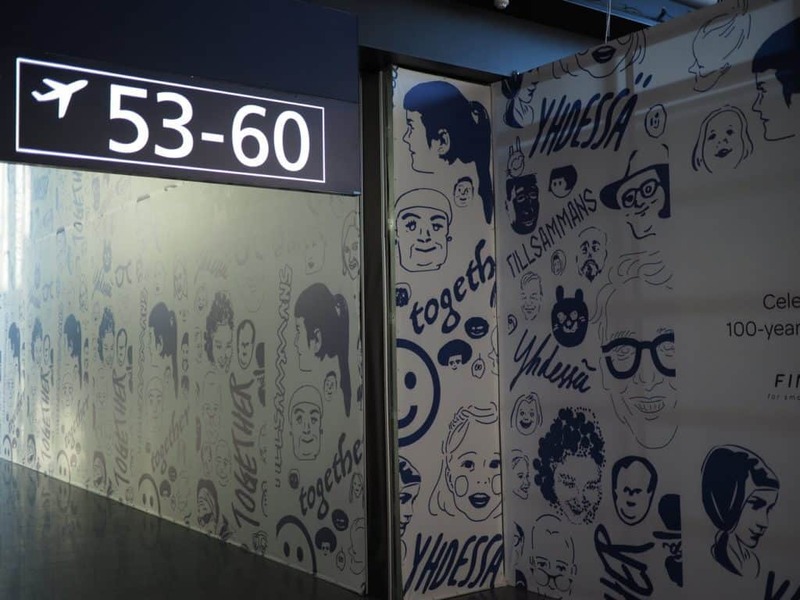 However, as an unwanted side-effect, I couldn’t reserve seats in advance on any Finnair codeshare flights. 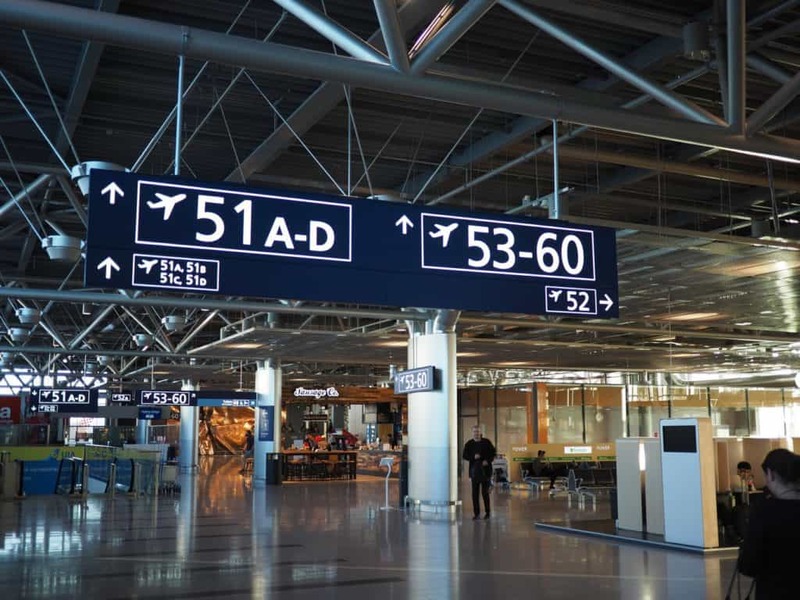 Do not book Finnair codeshare flights if reserving seats in advance is a necessity for you. Luckily the flight was not fully booked, so I managed to get a decent seat (4A) once the web check-in began, 24 hours in advance. 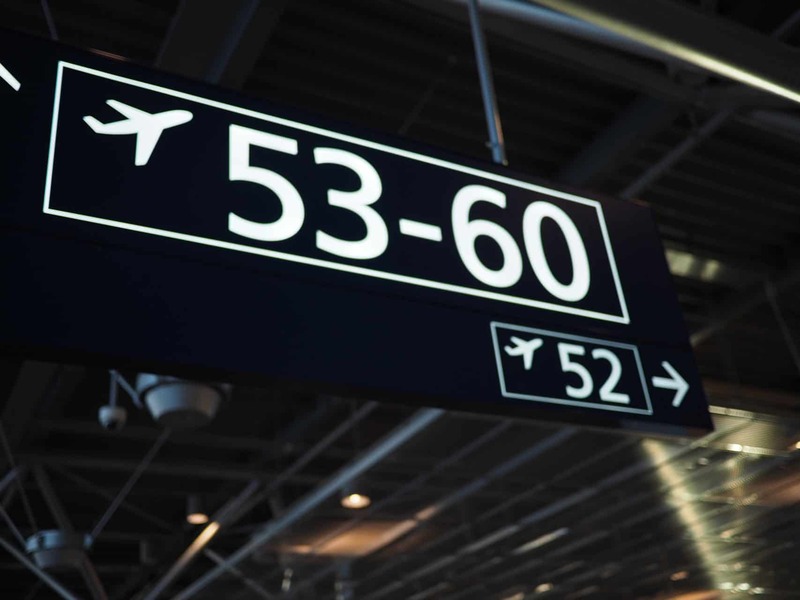 My flight to New York departed at gate 55 which is located in the new airport area. 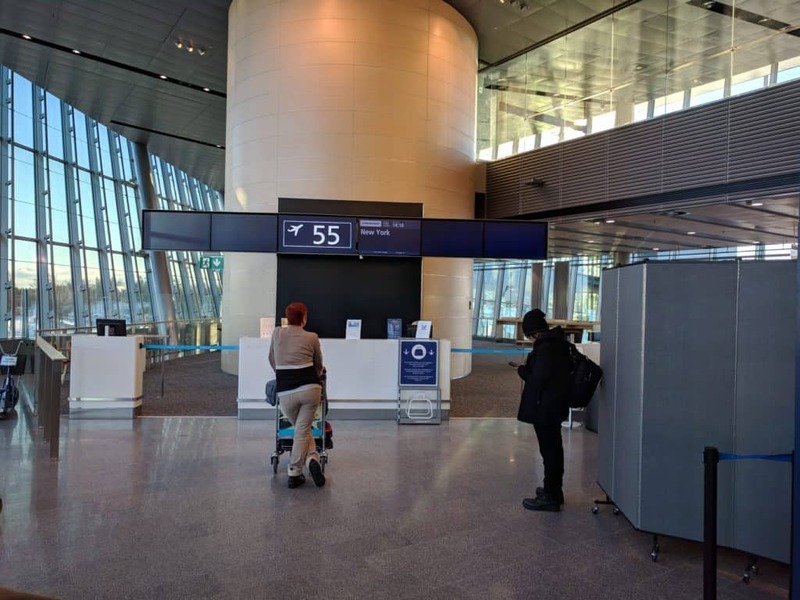 It’s a modern and quiet area with separate boarding booth for business class passengers and Oneworld top-tier customers. For some reason, I had an infamous SSSS marking on my boarding pass, so I knew there was going to be an additional security check. Boarding started on time, and once my ticket was checked, I was guided to the separate area for additional inspection. The whole process was pretty smooth and didn’t take more than few minutes. 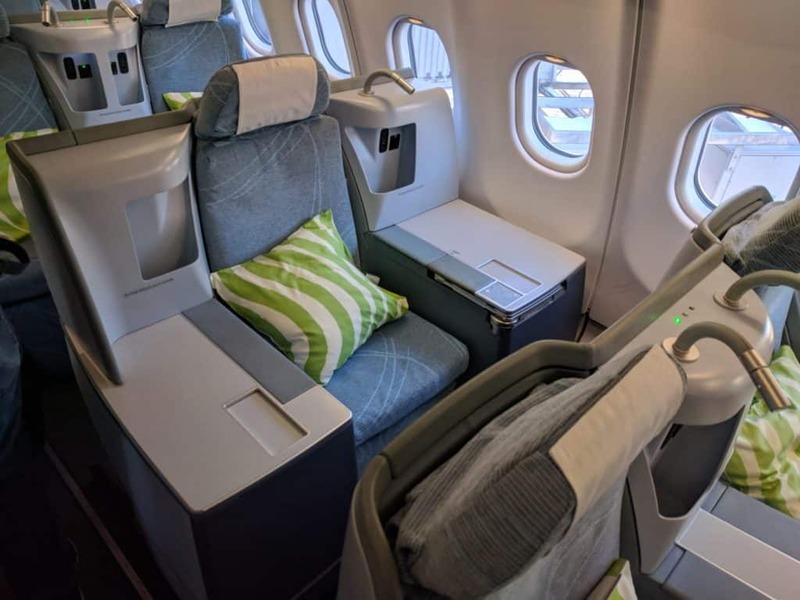 The cabin configuration of Finnair Airbus A330-300 is quite rare (1/2)-2-1, so selecting a right seat is more important than usual. 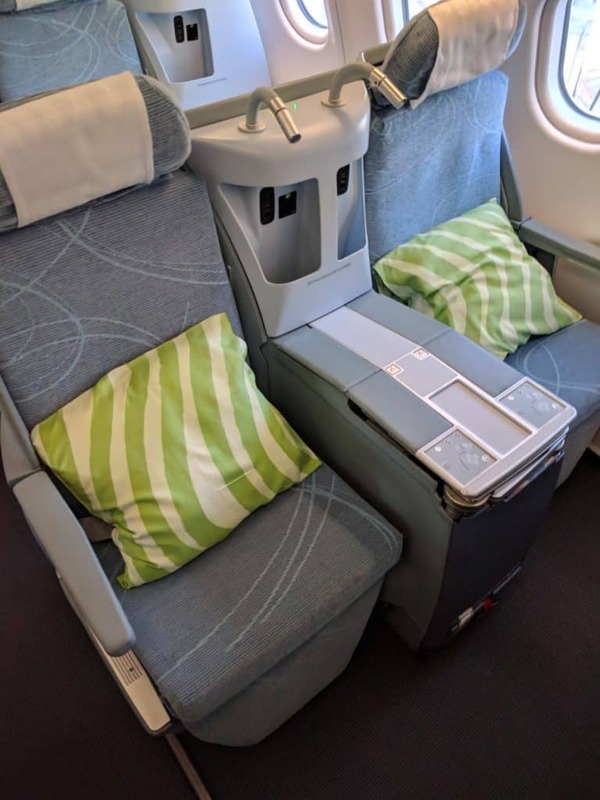 Finnair has two different seating variations for their A330, in this case, the business class consisted of seven rows in the forward of the aircraft. 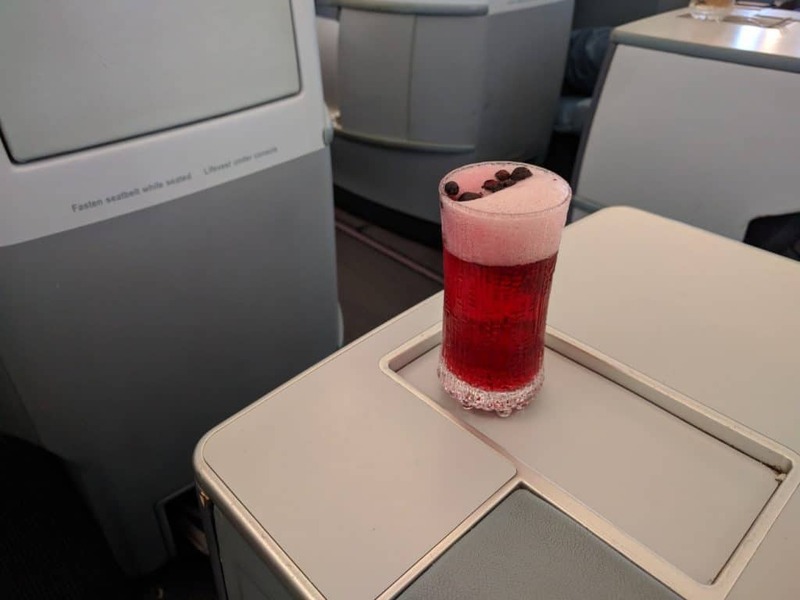 There is also another variation, with 10-row business class, which we flew from Chicago to Helsinki last spring. My seat 4A is one of the so-called “throne seats” with a plenty of table space on both sides of the chair (see the photo below). Also, a small bag can be put under the ottoman, and there are two storage compartments for shoes. Unlike Finnair A350-900 there is also an overhead storage above the center part of the cabin. As soon as I sat down, I noticed two things. First of all the seat looked OLD. 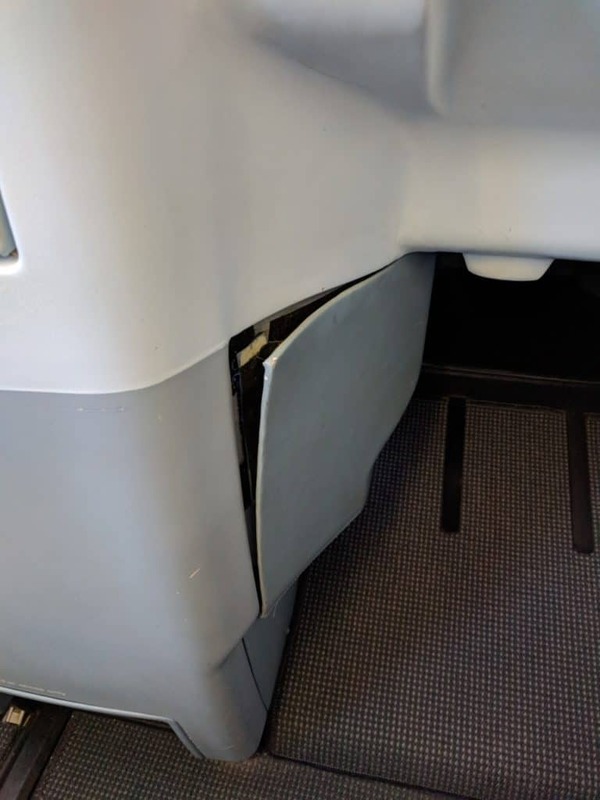 There were scratches everywhere, and the whole side panel of the seat was ripped apart. The second immediate observation was the hardness of the seat; it didn’t feel comfortable to sit in the upright position. 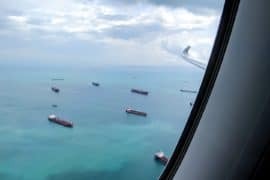 It was a complete opposite of super comfortable American Airlines A321T business class seat. If the upright position was uncomfortable, it could be even worse in the sleep mode. The foot space is really narrow, and there is not much space to bend your legs. 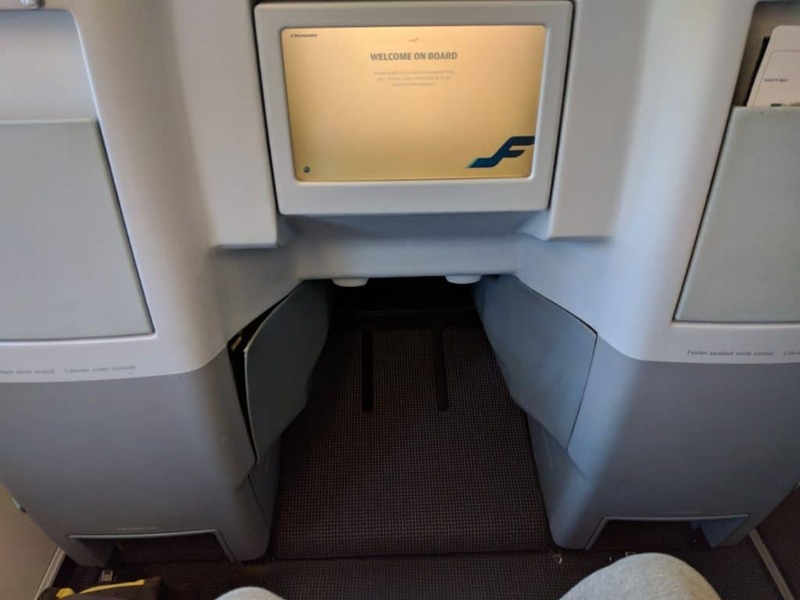 It is much more narrow than the mini-cabin front row seat 8A on other variation of Finnair A330. And since you are almost inside the seat in front of you, this coffin-like seat can feel a bit claustrophobic. If you are traveling alone, the even row 2/4/6 A seats are the best options. 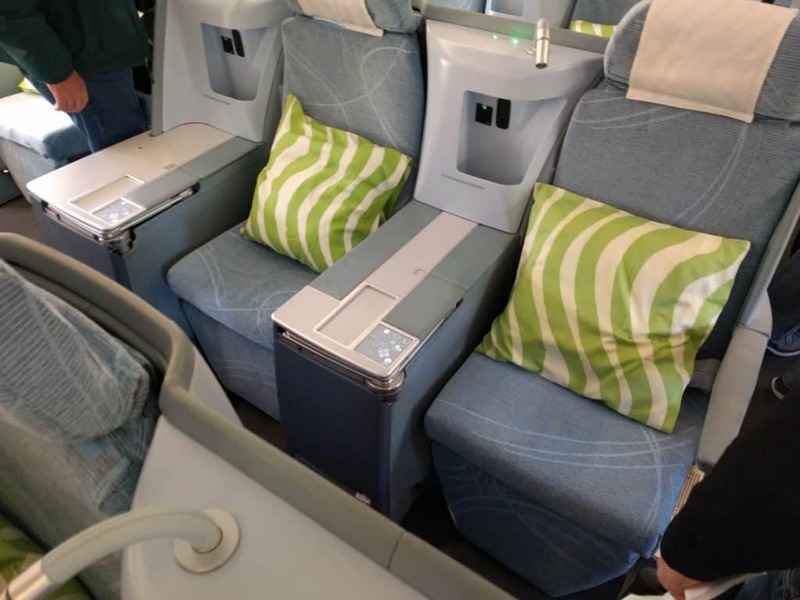 The next best options are on the other side of the cabin, seats 2/4/6 L. Middle seats or odd row A/B seats (see the photo below) are good when traveling with a partner since there’s not much privacy between the seats. Odd row aisle seats are really exposed, and cannot be recommended. 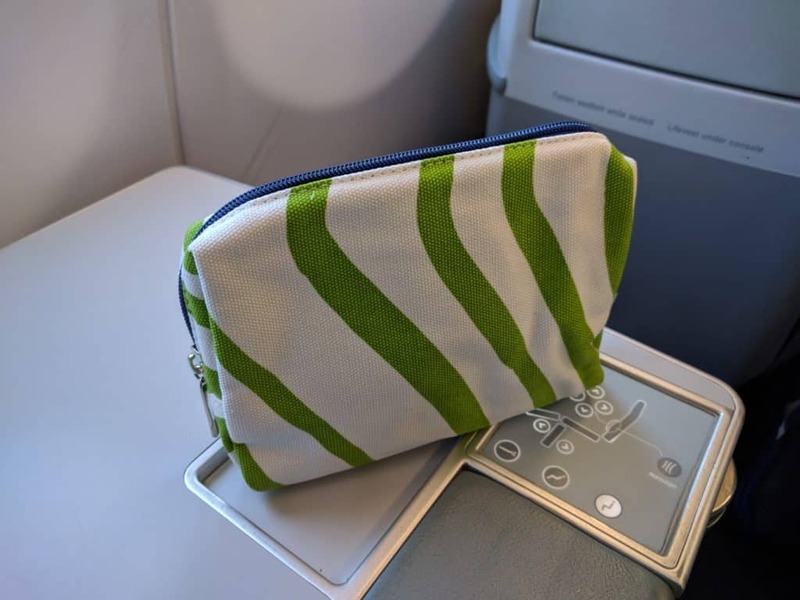 The Marimekko amenity kit was delivered shortly after the departure. Other than being Marimekko, it’s actually quite sad little pouch. 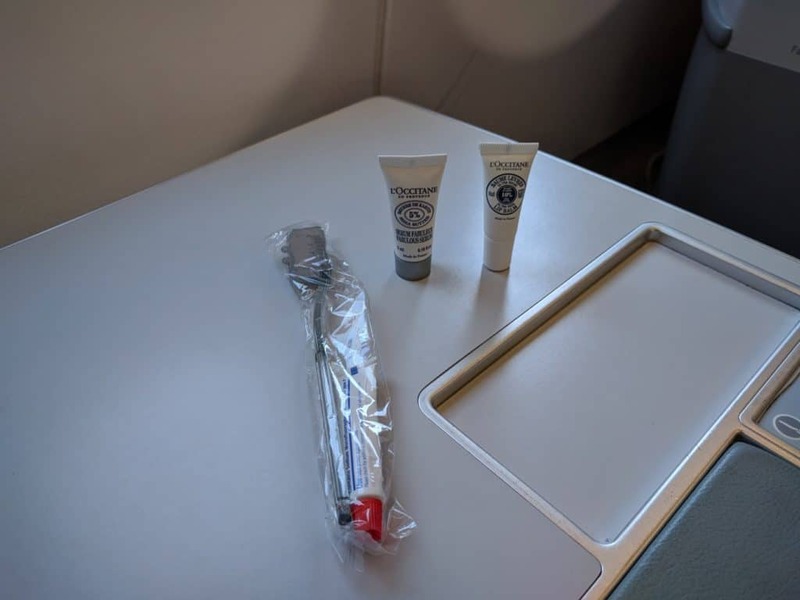 The amenity kit contained toothpaste and a brush, lip balm, some cream by L’Occitane, eye shades and a pair of earplugs. Marimekko slippers were also delivered. 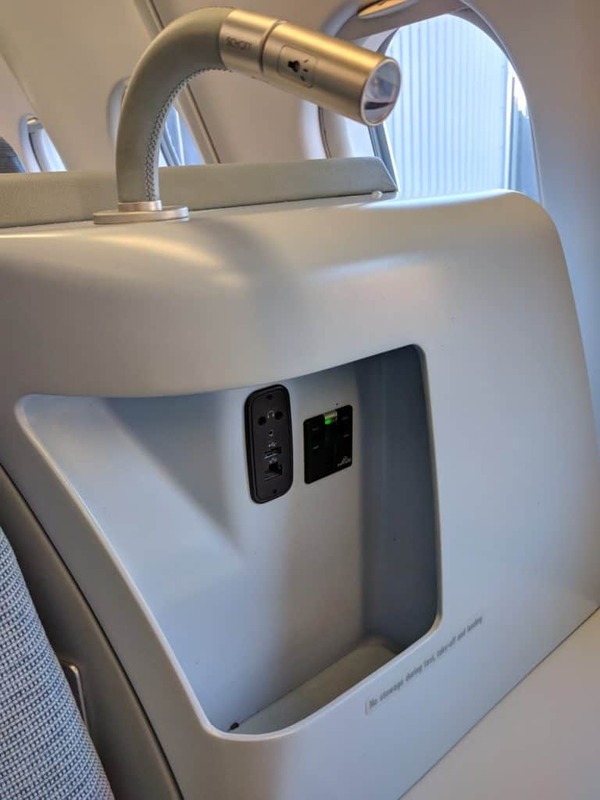 There were one USB port and a power plug for charging your devices. Both were ideally located, next to the table on the left side of the seat. 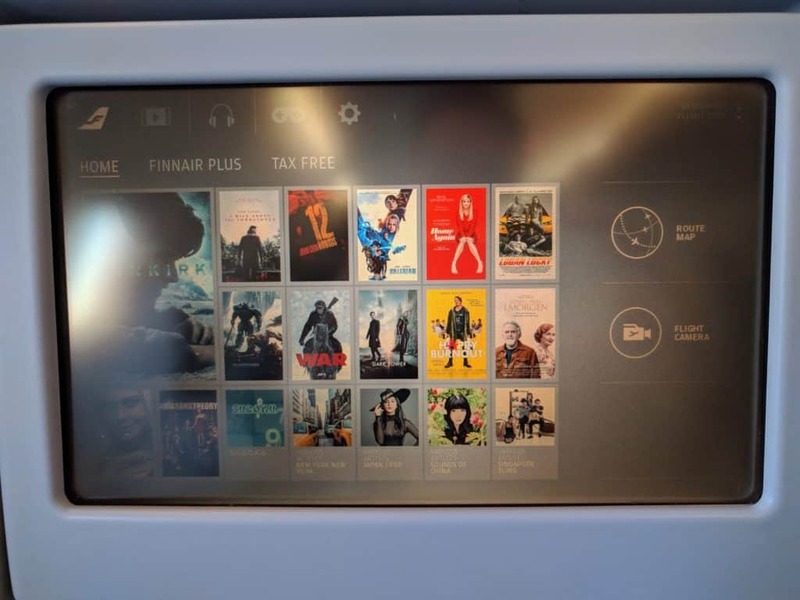 The In-Flight-Entertainment screen was 12.1”, much smaller compared to other Oneworld business class IFE screens. The display was fixed in place, but the vertical angle was adjustable. 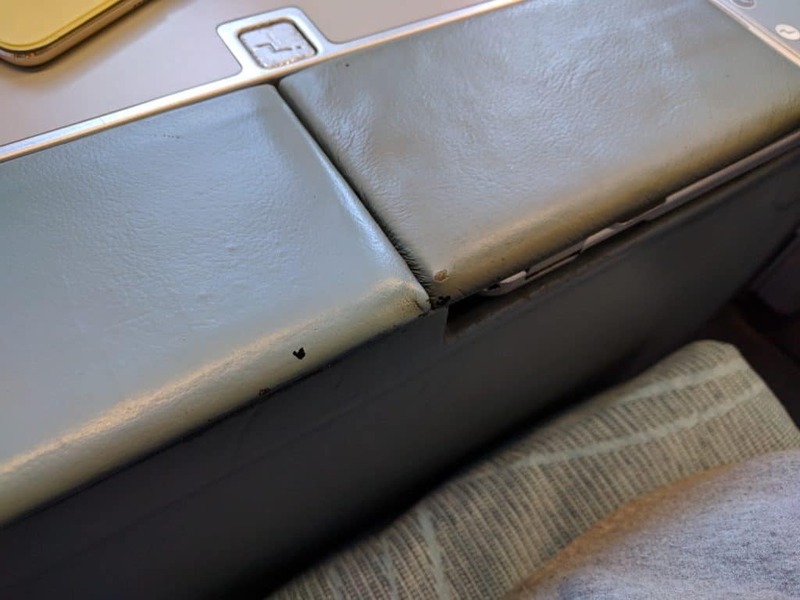 There was also a remote controller, hidden under the armrest of the seat. The situation is not any better with the headphones. 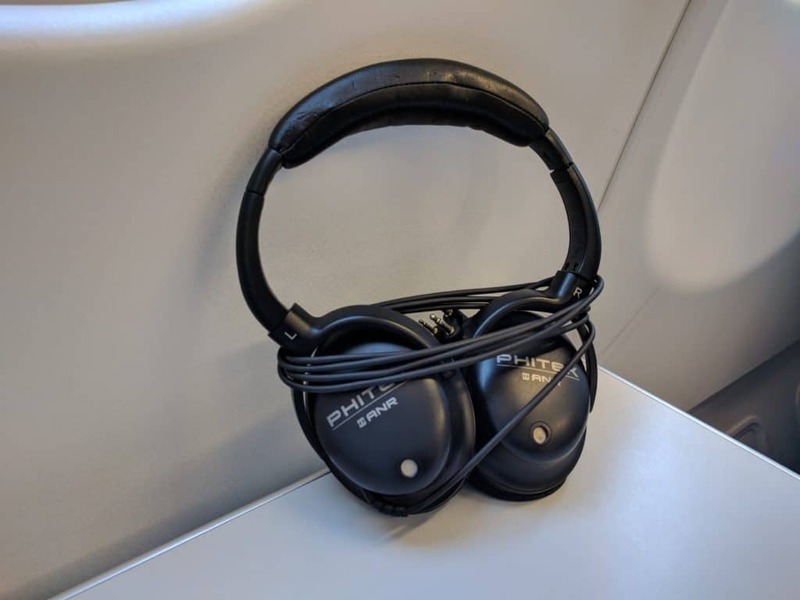 Finnair uses mediocre Phitek noise-canceling headphones on their A330 planes. The movie selection was pretty good; there were at least 100 movies available. About 20 of them were late releases like Dunkirk, War for the Planet of the Apes and Dark Tower. There were also over 100 TV series episodes to choose from, but unfortunately not full seasons. There is a Nordic Sky Internet on board, although you have to find how to use it by yourself. 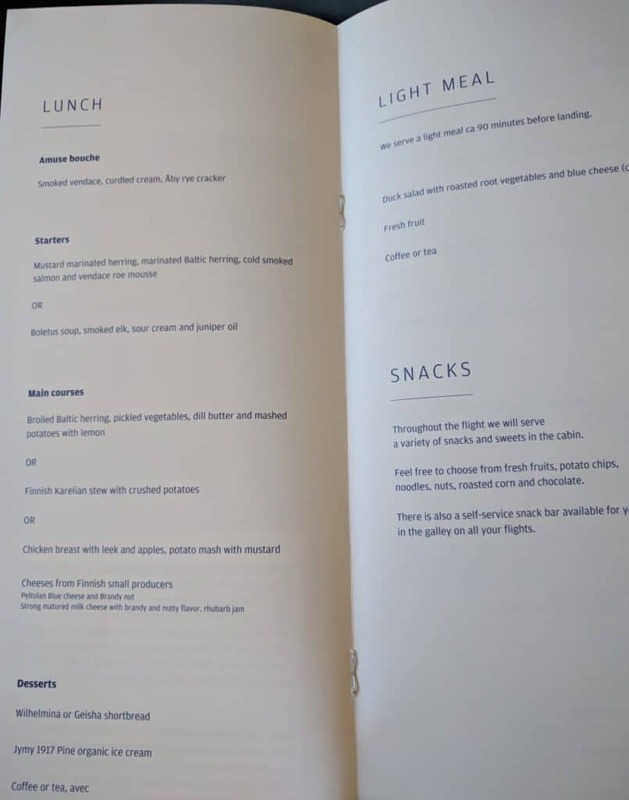 For some reason the internet access instructions cannot be found through the IFE system; it’s only available on the back pages of printed Finnair magazine. 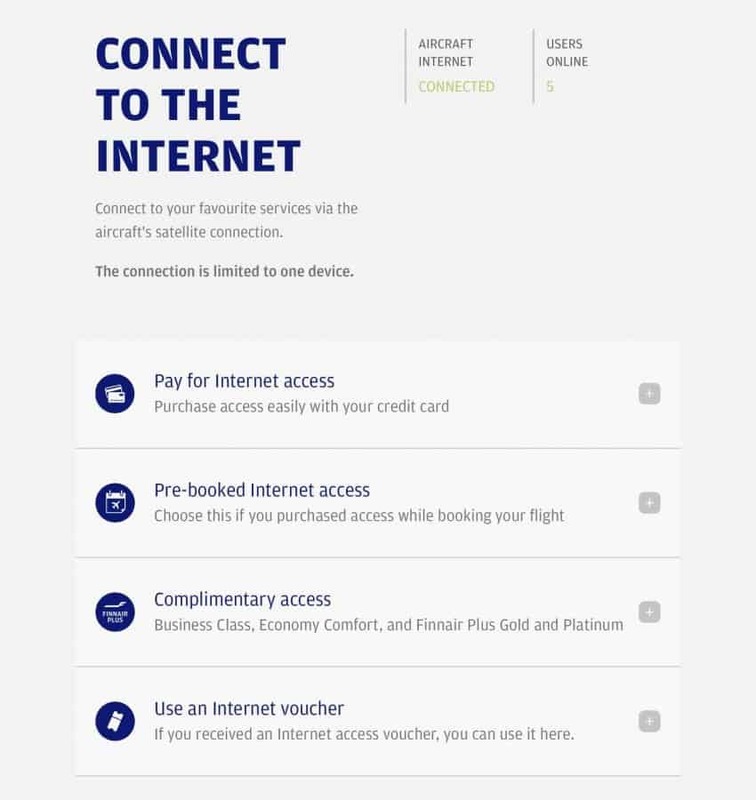 Business Class, Economy Comfort, and Finnair Plus Gold members are supposed to be eligible for 1 hour of complimentary Internet access. You should use your last name and the seat number to access the Internet, but it didn’t work in my case. 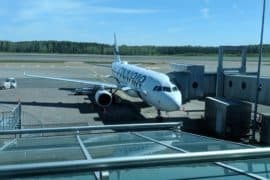 Even without the internet connection, Nordic Sky provides a lot of digital content, mostly magazines and newspapers (in Finnish only). As usual there Champagne, water or orange juice was offered before the takeoff. 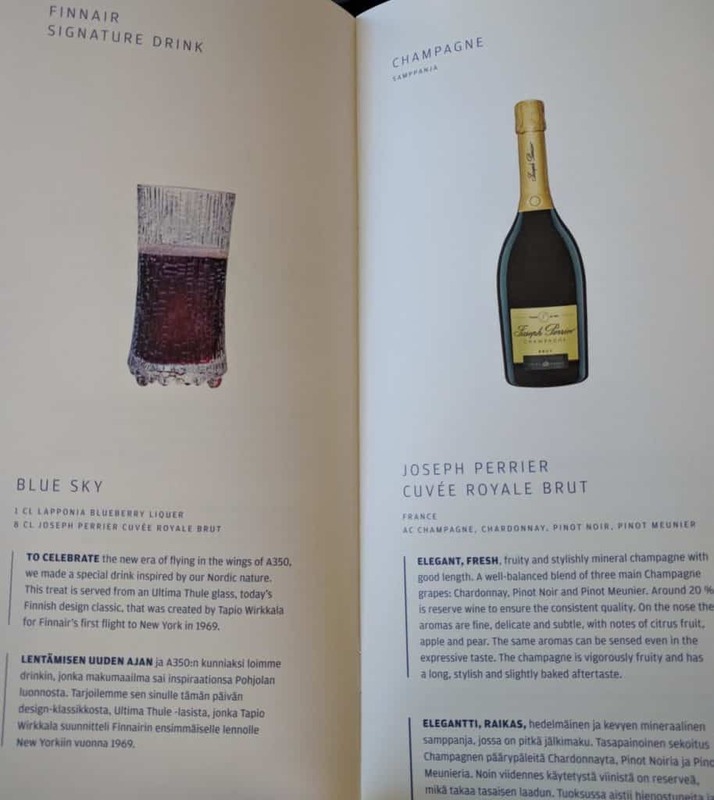 Before the dinner service, I had a Finnair’s signature Blue Sky drink while waiting for Amuse Bouche to arrive. 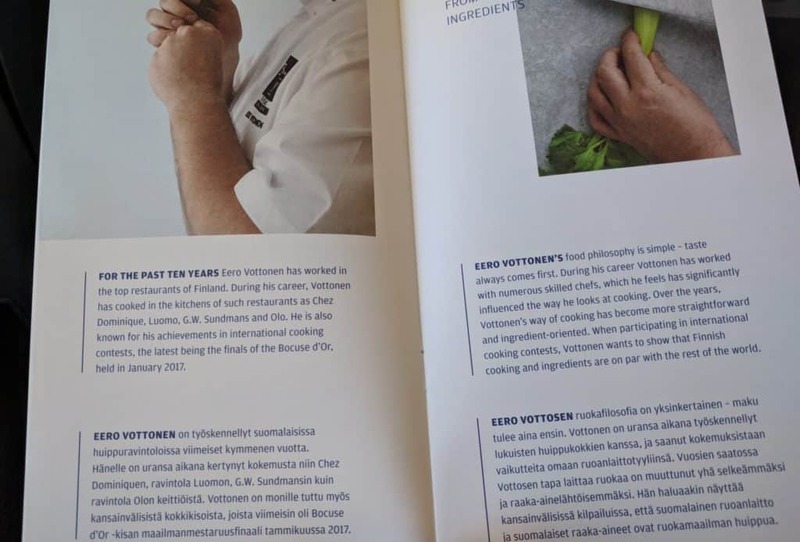 The menu was designed by Finnish chef Eero Vottonen, who has cooked in many top-rated Finnish restaurants. 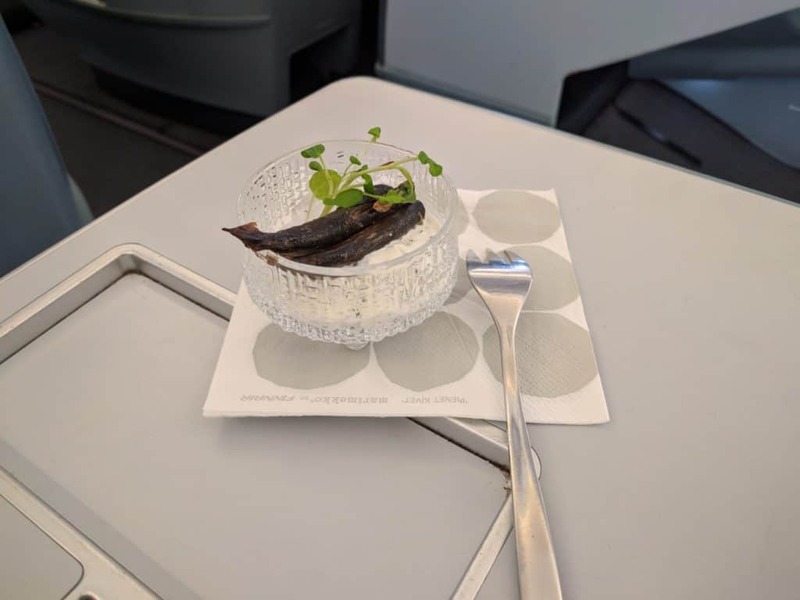 The Amuse Bouche of the menu, Smoked vendace on curdled cream was perfectly salted and very tasty. Out of two starter options, I chose the fish plate. 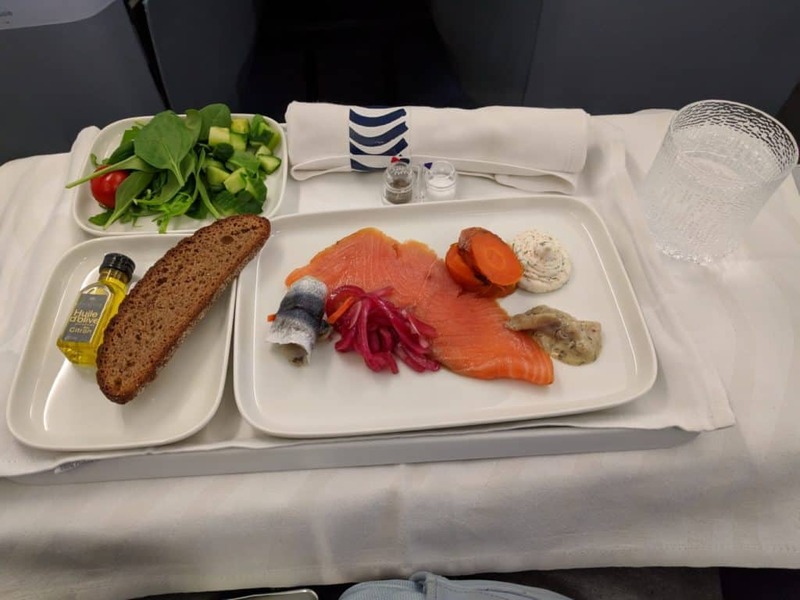 Cold smoked salmon was absolutely fantastic, but I wonder if marinated herrings might be too “exotic” for non-Scandinavians, even I don’t like them. The salad was basic, just plain vegetables. In general very Finnish dish. The main course was ok, but again quite exotic. My choice was broiled Baltic herring, pickled vegetables, and mashed potatoes (photo below). There were more traditional dishes, like Chicken breast, available as well. 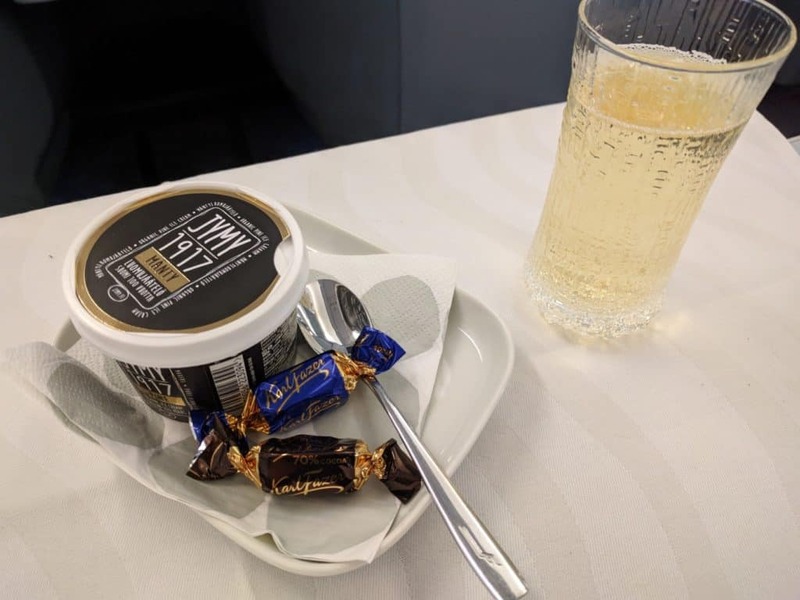 As a dessert, I chose Jymy 1917 Pine organic ice cream, which was served along with Fazer chocolate and some Joseph Perrier Cuvee Royale Brut Champagne. 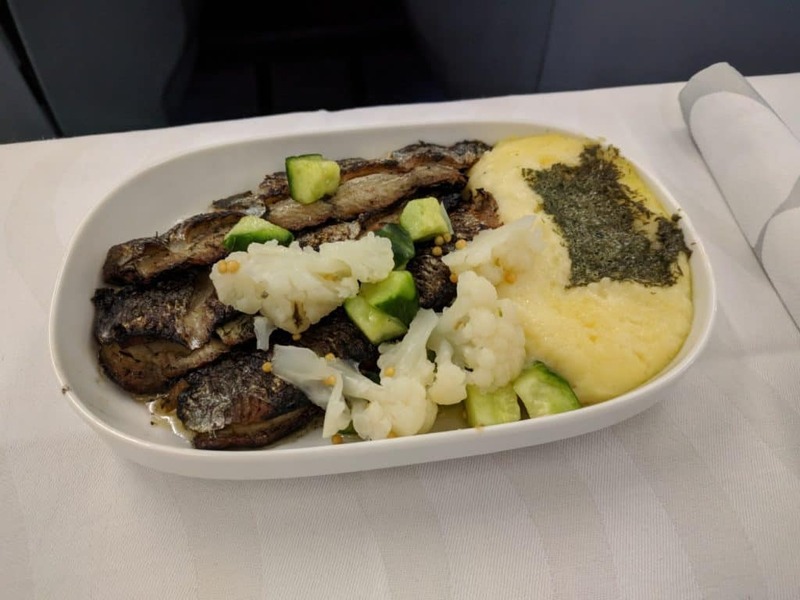 Before landing in New York, a light dinner was served. There was only one option, duck salad with roasted root vegetables and blue cheese. It didn’t look too inviting, but with some balsamic vinegar and pepper, it was edible. Would have liked more options though – something like a simple sandwich would be awesome. Service on this A330 flight was friendly and more attentive than usual on Finnair. Maybe it was my lucky day?